The 47 CJ2a we call Ole Yeller was and still is our working farm jeep. It lives in the barn and gets little attention. It always starts and runs well. It does smoke a little and the body is still in terrible shape. 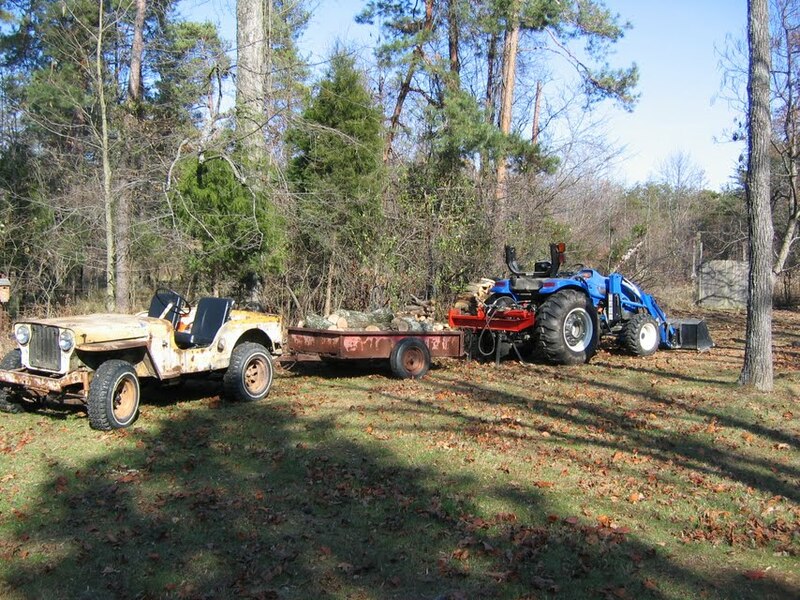 The major tasks this time of year for Ole Yeller involve hauling chainsaws and equipment into the woods and pulling a trailer full of firewood up steep trails. Last week, Barry climbed into Ole Yeller for another round of wood cutting. It cranked, but wouldn’t fire. As stated, this is a reliable starter. Something seemed to be wrong with the fuel. Barry pulled the glass bowl on the fuel pump and saw lots of brown particles on the screen. He cleaned it as best he could and reinstalled the bowl. He cranked the engine again and it still didn’t fire. Time for the time-honored, but dangerous, technique of pour a little gas down the carburetor to see if fires. It works and Ole Yeller seems to be running fine. But maybe it is time for a real fuel filter. There is no evidence of a filter ever being installed and it seems to be a cheap investment. The auto parts store wanted to do a vehicle look-up to get a part number. After suggesting that the jeep didn’t have a filter they finally came up with a “generic” model. That should work. It didn’t. The short section of rubber hose was too small to accept the filter. But Barry did discover that the inlet line to the pump was loose. When he removed the rubber line, the steel inlet line swung free! That would explain the fuel problem, but the filter still seemed like a good idea. Back to the parts store for a different filter. The parts guy paraded six different filters out, all with fittings too large to fit the line. Finally settled on a packaged model with multiple fittings. Evan was scheduled for a “jeep day” and, while Ole Yeller was parked in the garage, it seemed like a good time to get another project done. On the parts shelf was a brand new e-brake cable. 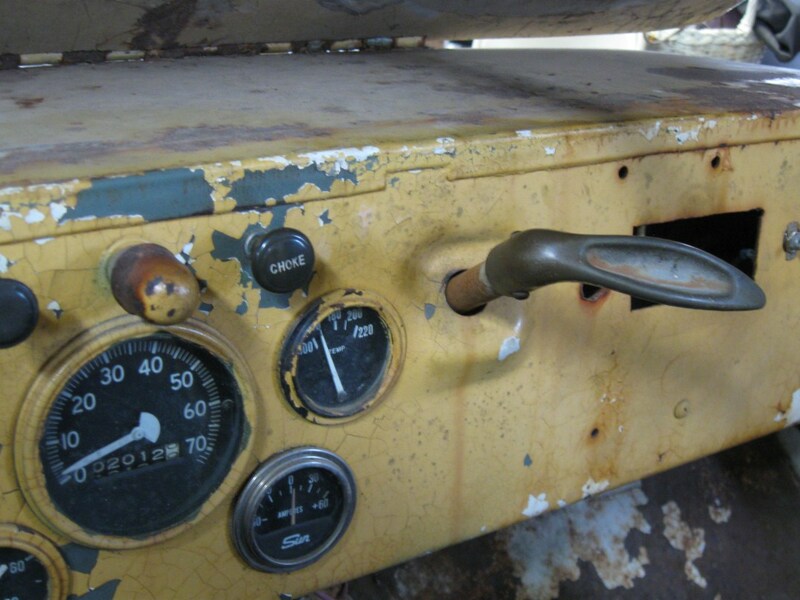 None of the farm jeeps Barry had driven had a working e-brake. 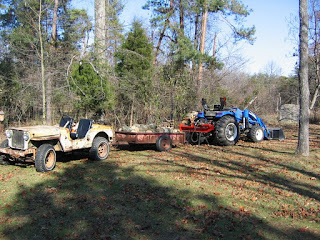 But the working e-brake on Ole Blue was great, especially on the hills of Lawson Hill Farm. 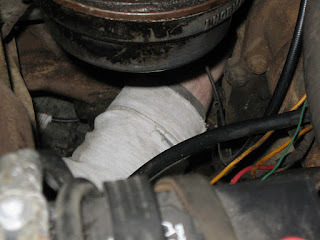 While Evan installed the new fuel filter, Barry started disconnecting the e-brake cable. One of the many joys of owning an old jeep is discovering what changes the PO (previous owner) has made. In this case, we have the multi-part (tab with hole for wire attached to a spring) brake lever return mechanism replaced with an old fashion screen door spring and a couple of bolts. Perfectly simple and perfectly functional! Getting the cable disconnected was much more challenging. By all appearance, it was the original cable installed at the factory. The cable cover (metal) was attached with clips at two points on the engine/transfer case and to the firewall. The cable was attached to the brake lever and to the “cane” handle under the dash. The adjustment clevis had been coated with leaking fluid over the years, so the nuts turned easily, but required some time since there was limited space for turning a wrench and ratchet. Separating the cable from the handle took a hammer and chisel. Evan managed to get the clip off the firewall and Barry was able to get the clip out of the engine block. 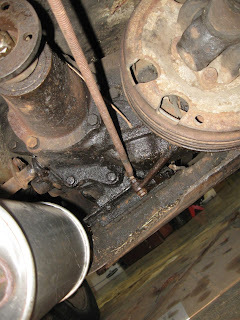 The last clip was on the transfer case and covered by the transmission/transfer case skid plate. As we took a look at removing it, it was clear that the PO had bend it on rocks or stumps or something. The easiest way to reach the clip was to drop the skid plate. However, there appears to be a rivet in one corner and 3 bolts in the other 3 holes. Our second option is to drop the cross member, but that would be a major undertaking. ﻿﻿﻿ The only other option was to reach in on top of the skid plate with a long wrench and use a socket through a hole in the skid plate. Luckily, Evan has long arms and by stretching could reach the top nut. Even luckier was the bolt breaking after a couple of turns. At some point during this process, Evan asked if we should check and see if the e-brake was still operational. Barry had assumed that the frozen cable was the issue, but had no idea if the e-brake itself would still function. So Barry crawled under the jeep and activated the brake lever while Evan rocked the jeep. With both relief and surprise, the brake stopped the drive shaft from moving! If we could get the new cable installed, we could have a working e-brake. ﻿﻿﻿ A test drive proved that we did have a working e-brake. It did require a hard pull on the handle on the steepest part of the jeep trail in the woods, but it did hold. We may do an adjustment, but for now we will enjoy our new safety feature. Previous PostPrevious Who needs wipers?